The abduction of Mazi Nnamdi Kanu in his home town by the Nigerian military and her murderous government is a glaring threat to global peace. It is a thing of pain and disappointment to me seeing Nigerian government swimming in Wickedness, evil and other heinous atrocities. What have the poor masses done wrong to deserve these ruthless killing, Illegal arrest and Molestation? Biafrans, since 1914, have been caged in slavery under Nigeria with the help of British empire (LORD FREDRICK LUGARD). Nigeria is not working and can never work until they allow Biafrans to have their freedom as an independent Nation. Recall, on the 14th Day of September, Nigerian Military invaded Nnamdi Kanu's home at Afara Ukwu Ibekwu in Abia State under the code name of 'operation python dance', killing countless number of Innocent Biafrans in his home which since that very day his whereabout became unknown. Who knows if he was among those that were brutally shot dead. We were born to be free not to be caged in captivity under the auspices of 'one Nigeria'. 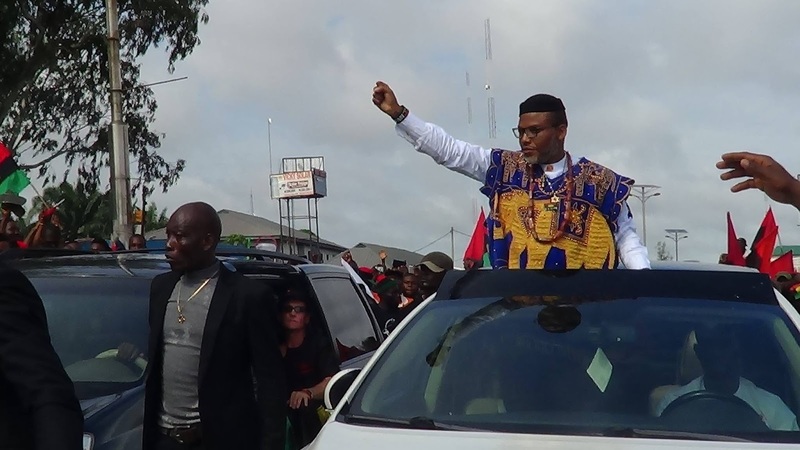 Nnamdi Kanu revealed the truth to us, brought us out of darkness/blindness and finally bravely taking us into the marvelous light that Chukwu Okike Abiama has ordained for his children (Biafra). Those politicians in Nigeria from Biafra extraction that are still doubting our total resolve to be free from Nigeria does that at their own peril. My only message to those political rogues from Biafra extraction is, they can continue in their political bandwagonism of 'one Nigeria' with their paymasters while they allow Biafrans at large to secede from the evil contraption called Nigeria in peace. We are not ready to war with any country, organization or group. Biafra restoration is our ultimate goal and we shall restore Biafra via every legitimate and peaceful means. Moreover, World leaders should urge Nigerian military to desist from the constant arrest of IPOB activists across Biafra land and again produce Nnamdi Kanu for us because he has not committed any crime that will warrant such an inhuman treatment. His only crime was speaking the truth and exposing all the evil things inherent in the political entity called Nigeria. He was only asking for Freedom of speech, Self determination, equal right and Justice from the ruthless Nigerian government as enshrined under International Law (UN CHARTER). His silence ever since the Nigerian Military brutally attacked his residence is really disturbing and must not be taken lightly by all lovers of freedom! Every genuine lover of freedom must work assiduously to compel Nigerian government to produce the leader of the Indigenous People Of Biafra, Nnamdi Kanu. I hereby, urge UN, AU, EU and other World Bodies to as a matter of urgency intervene in the atrocities been melted against IPOB members and Biafrans in general and also pressure the Nigerian government to produce Nnamdi Kanu either dead or alive because his absence portends a great threat to global peace.